Facts and figures. The Women’s March on Washington had three times more people turn out than Donald Trump’s inauguration, with nearly half a million marchers descending upon the nation’s capital on Saturday, January 21, experts say. Two crowd scientists, Marcel Altenburg and Keith Still, from the Manchester Metropolitan University in Britain, analyzed photographs and videos taken at the National Mall, the site of both the march and the inauguration, to estimate the number of people at each historic event. Based on images, Altenburg and Still estimated that there were approximately 160,000 people in attendance at Trump’s inauguration and at least 470,000 people who marched on Saturday. According to The New York Times, the scientists compared images from peak points on both days, when the crowds appeared to be fullest. 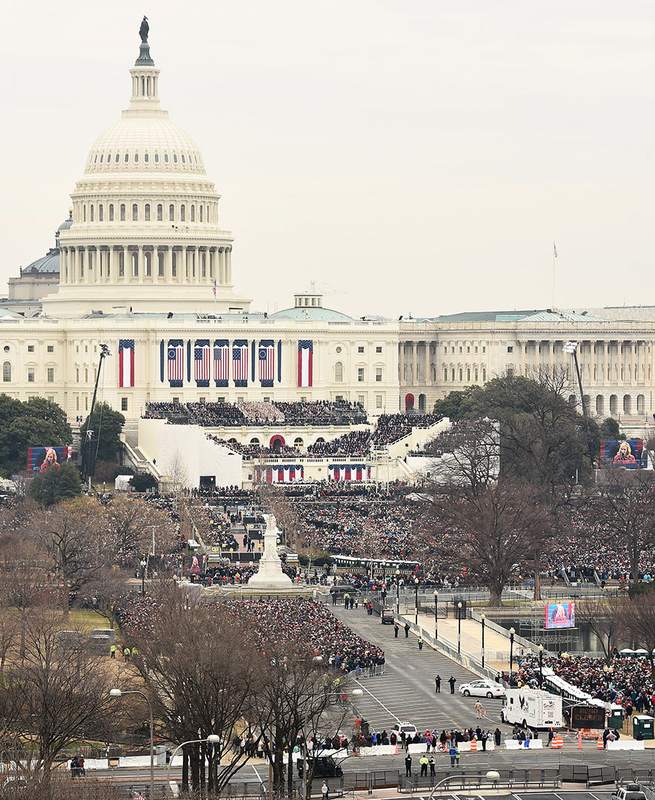 In one image of the inauguration that has circulated the internet, the Mall appears to be two-thirds empty, with crowds pressed toward the front of the Mall. By contrast, attendees at the Women’s March appear to nearly fill the entire area save for some emptier spaces toward the back of the Mall. 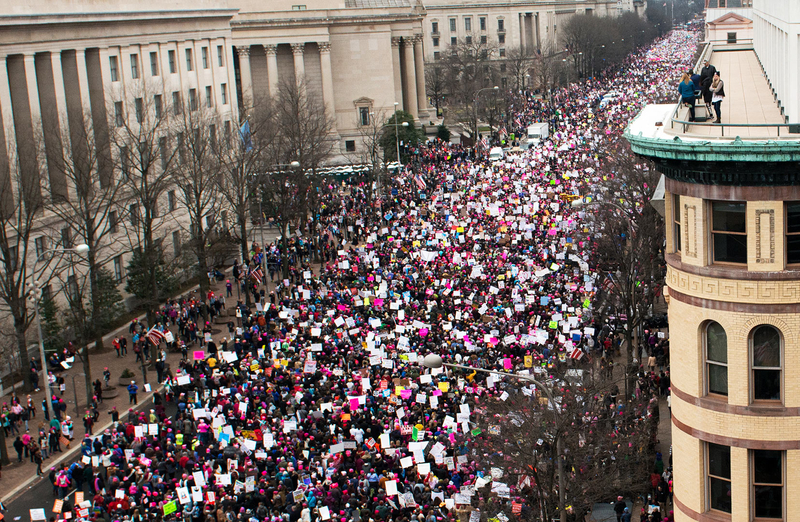 The Washington Post reports that organizers of the Women’s March on Washington originally sought a permit for 200,000 people, but by their estimates as many as half a million people participated. Both Trump, 70, and his White House press secretary, Sean Spicer, falsely claimed that the media had twisted their reporting to undermine the number of attendees at the new president’s inaugural events. “This was the largest audience to ever witness an inauguration, period,” Spicer said during a briefing at the White House on Saturday, January 21. All evidence and facts prove to the contrary. The press secretary also claimed that photos had been “intentionally framed” so as to downplay Trump’s crowd, another statement that is not rooted in fact. Trump himself seemed to disregard facts as he tweeted early Sunday, “Watched protests yesterday but was under the impression that we had an election!” he tweeted. “Why didn’t these people vote? Celebs hurt cause badly.” He also boasted about his ratings on television. “Wow, television ratings just out: 31 million people watched the the Inauguration, 11 million more than the very good ratings from 4 years ago,” he wrote. Nielsen ratings show that while Obama did indeed have a viewership of 20.6 million in 2013, Trump’s inauguration actually ranked fifth highest in total viewers, behind Reagan in 1982, Obama in 2009, Jimmy Carter in 1977 and Richard Nixon in 1973. Though no official count has yet come in with regards to the total number of marchers internationally, the Washington Post estimates that more than 1 million people gathered in cities as wide-ranging as Los Angeles, Melbourne, Australia and Juneau, Alaska. The Women’s March official website notes that 673 marches were held worldwide.